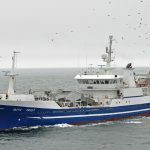 Although trawling in 280 fathoms in the North Atlantic, shortly after fishing had been curtailed by three storms in quick succession, is potentially a challenging start in a fishery well-known for giving problems, Taits is reported to have performed well, before landing a quick-fire shakedown shot into Killybegs, just seven days after the vessel berthed in its home port of Fraserburgh for the first time. After landing 1,300t of blue whiting into Killybegs, Taits headed back out for a second go that resulted in 1,500t being discharged at Peterhead to complete its quota. Taits approaching Fraserburgh for the first time. 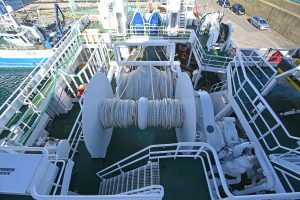 The skippers and crew expressed their full satisfaction with the efficiency of the vessel’s engineroom and deck machinery, fish pumping and storage systems, and electronics equipment, together with the well-matched fishing gear. 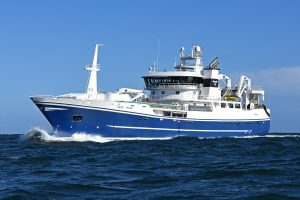 This smooth start highlights the forward thinking and vision of everyone who contributed towards the end result of a design and build project that the Klondyke Fishing Company initiated three and a half years ago by contacting the Norwegian companies Rolls-Royce Marine AS, Ålesund as designers, and Westcon Yards AS, Ølensvåg, who built the new vessel. Overall view of the engineroom. 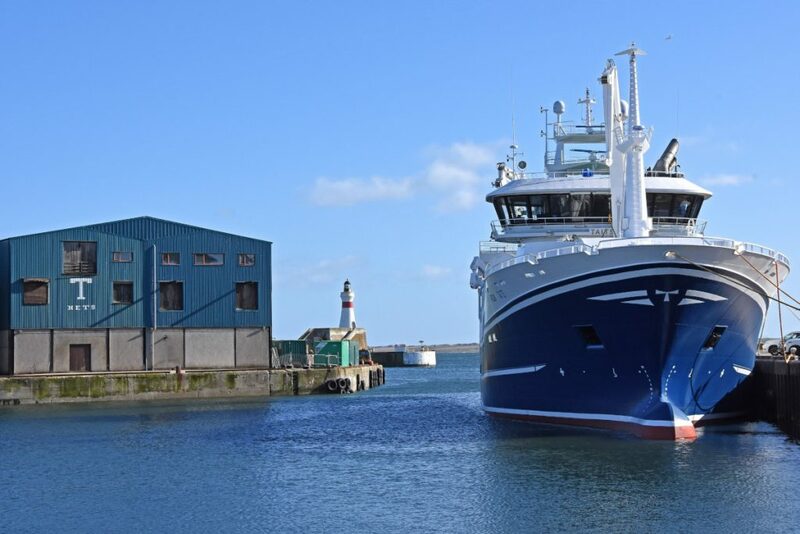 Taits’ arrival at Fraserburgh last month, when the vessel berthed within 50m of Klondyke Fishing Company’s offices, was the latest example of the family’s commitment to the pelagic sector that now spans three generations of skippers. 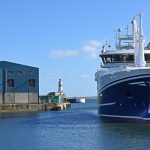 The new vessel is expected to land almost exclusively to Denholm Seafoods of Peterhead, thereby continuing to support the fish processing infrastructure in NE Scotland. 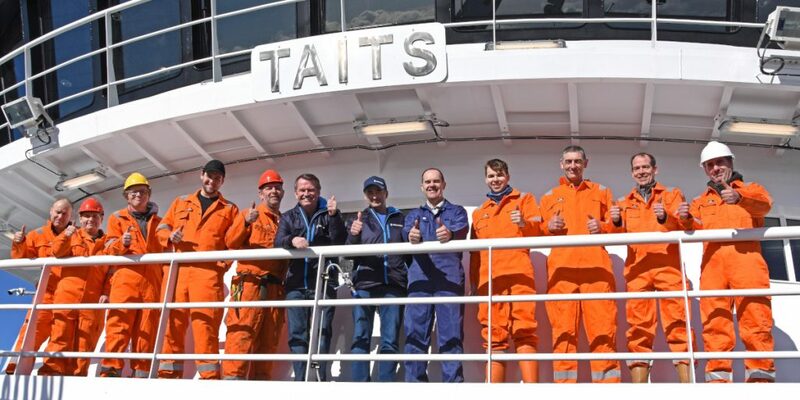 Taits replaces its 71m predecessor of the same name, which was sold to Norway 18 months ago, and renamed Steinsund, when its replacement was in the early stages of construction. 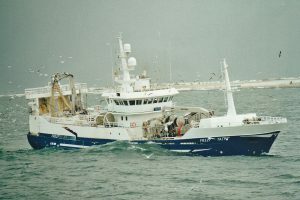 Having skippered Chris Andra FR 228 since 2007 – when the 71.1m midwater trawler was delivered by Westcon Yards AS to a Rolls-Royce Marine AS design – during which time the vessel has fished successfully, the owners unsurprisingly used this vessel as a starting point for the new build in terms of general principle and layout. General view of arrangements on the trawl deck from atop the gantry. The continual rapid advancement in new technology is clearly illustrated on Taits, which includes a number of forward-thinking ideas designed to enhance fuel efficiency and operational safety. These include a heat recovery system, in which hot water from the main and auxiliary engines is used to heat all internal areas throughout the vessel; a fuel-saving Rolls-Royce Promas propulsion and manoeuvring system; two stern thrusters; and a Furuno big bridge system, in which five 55in tilting displays can be arranged in multiple configurations through an embedded video wall controller. 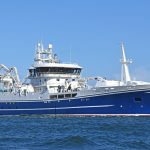 Another key feature is the high level of duplication, and in some cases triplication, that the owners specified, in order to ensure that their vessel will be able to complete full trips when fishing several hundred miles from harbour. 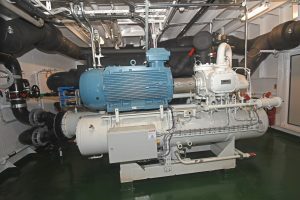 Examples of this include the triple integrated low-pressure hydraulic system for the deck machinery, the capability to pump pelagic fish aboard both over the stern and amidships, and a high level of redundancy in the vessel’s Type Approved and touch-screen navigation systems, that are served by three independent power supplies. 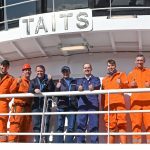 Good to go – the skippers and crew of Taits give the new midwater trawler the thumbs-up, while rigging out for the blue whiting fishery at Fraserburgh. Left to right: George Maitland, Jimmy Buchan, Bob Tait, JC Tait, George Cruden, Peter Tait, Willie Tait, Stephen Rennie, Steven Beagrie, Ewan Scott, Terry Cardno and Lewis Duthie. 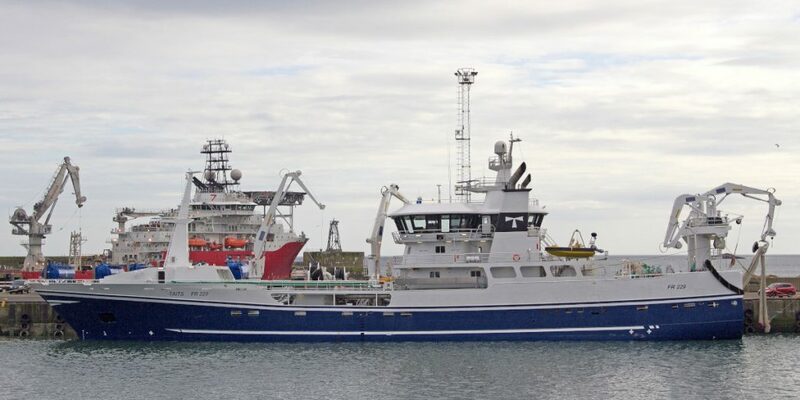 With main dimensions of LOA 74.8m, registered length 66.64m, beam 15.5m, moulded depth (shelterdeck) 9.5m, and a draft of 7.7m, Taits was specifically designed to operate from Fraserburgh harbour, thereby continuing the owners’ longstanding family tradition that goes back to the days of sailing drifters. 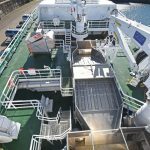 Taits effectively features three continuous decks, main, shelter and forecastle, on which two 52t anti-roll tanks are located forward, together with a streamlined compartment housing the anchor windlass and mooring winches. 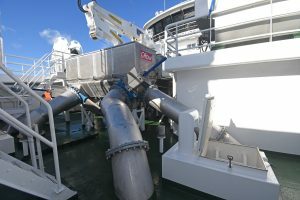 Although initially rigged solely for midwater trawling, provision has been made to enable the vessel to be rigged for purse-seining at a later date, should this option be required. Strengthened deck plates are incorporated into the hull in areas where purse winches would be fitted. 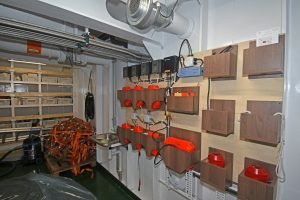 At forecastle level, the deck house is offset to port to enable a Tristar purse-net hauler to be fitted on the starboard sidedeck. 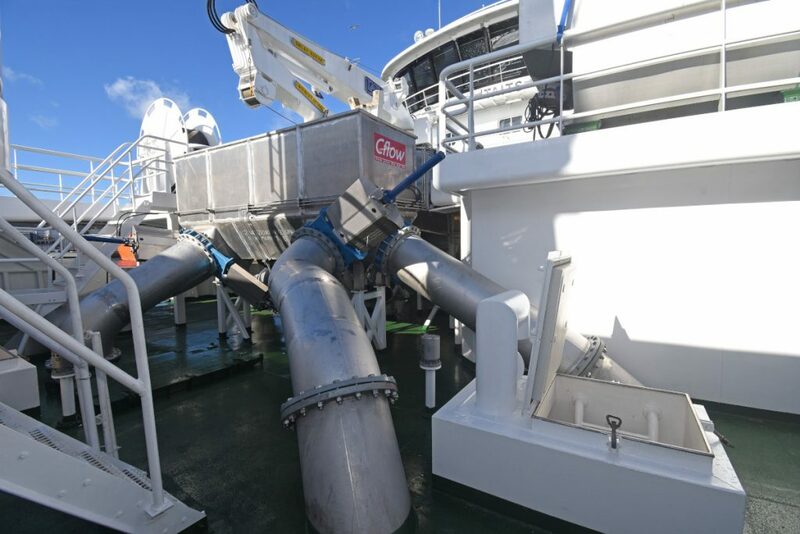 The C-Flow fish dewatering system is positioned in the middle of the forecastle deck amidships. With a capacity of 2,200m³, the 11 RSW tanks on Taits are arranged from forward in four tiers of three, two, two and four. 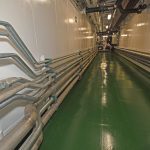 The forward middle tier of tanks is positioned adjacent to the hull sides, to create a large central area in which the vessel’s vacuum landing plant and RSW pump/manifold rooms are arranged directly above each other over three decks amidships. 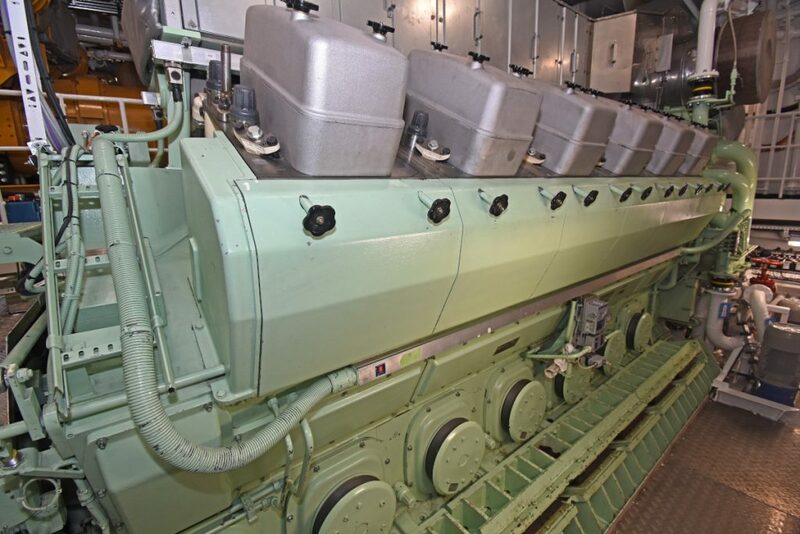 Below the main (third) deck, the hull is subdivided into forepeak, bow thruster/sonar room, high-pressure hydraulic plant room, forward insulated RSW tanks, RSW manifold room, two aft tiers of RSW tanks, engineroom/electrical switchboard room (starboard), and aft peak with lube/hydraulic oil and fuel tanks. 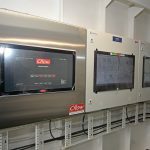 The Furuno big bridge system is driven by an advanced video wall controller integrated into touch-screen command units. 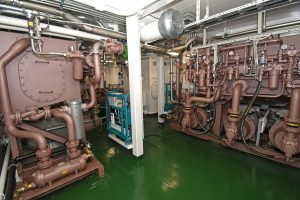 At main deck level, the arrangements from forward are forepeak, switchboard room, refrigeration plant room, forward RSW trunking, vacuum pump room, 2 x RSW trunking, low-pressure hydraulic room (port), three single-berth engineer’s cabins (starboard), engineer’s workshop, and high-pressure hydraulic plant room. A large store lines the starboard side aft, which if required in the future, could be used as a purse-net bin. 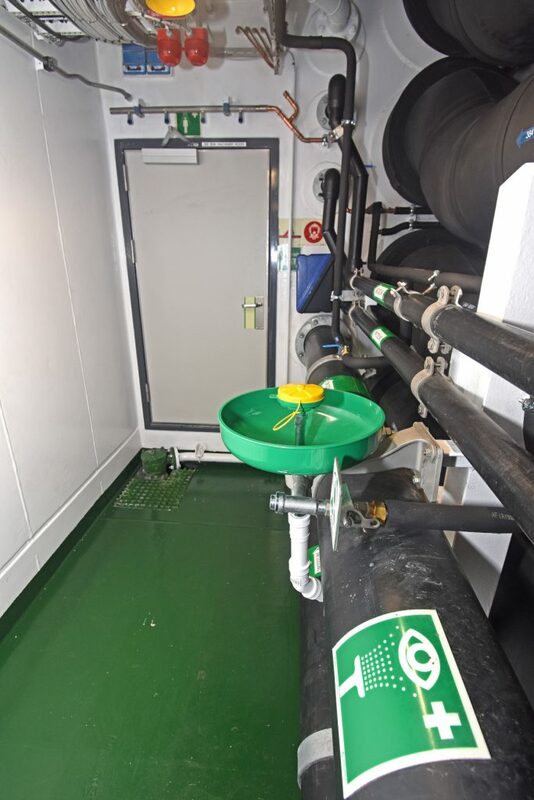 Layout on the shelter (second) deck consists of forepeak store, harbour genset room, tank tops with delivery pipes for RSW tanks, deck house for fish sampling, and pumping and vacuum landing control screens. Six double-berth cabins, accessed from a full-width passageway, are positioned across the fore end of the deck house, which also includes a fitness room. The crew’s deck change wardrobe lies to starboard. At forecastle deck level, an expansive day lounge is located to starboard of the adjoining messdeck, and cook Lewis Duthie’s stainless steel galley on the portside. 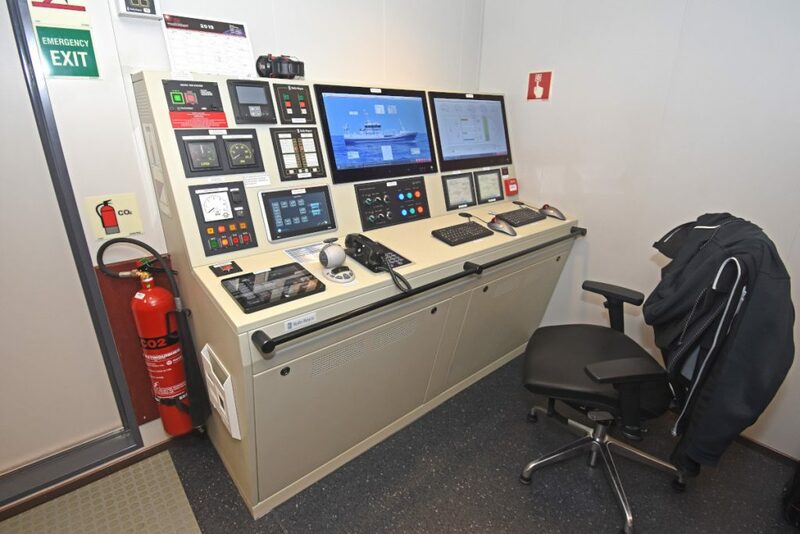 Three single-berth skipper’s/mate’s cabins, together with an instrument room, are arranged on the next level up (boatdeck), directly below the wheelhouse. All the accommodation areas onboard Taits are finished to high levels of specification and workmanship. 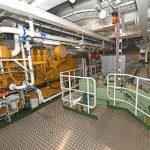 Taits features an integrated Rolls-Royce Marine propulsion package. 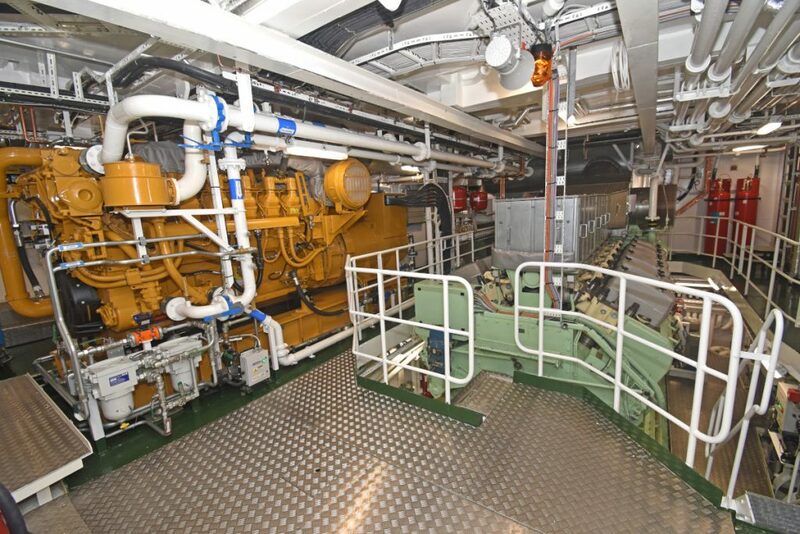 This is centred on a Bergen Diesel B32-40 LSP main engine of 6,000kW @ 750rpm coupled to a matching Kamewa Ulstein 5.35:1 reduction gearbox and a 4,200mm-diameter CP propeller. The choice of centreline machinery highlights the degree to which the owners have been satisfied with similar installations on the previous Taits (2000), Challenge (2004) and Chris Andra (2007). The main difference is that the new Taits is fitted with a Rolls-Royce Promas propulsion and maneuvering system, in which the propeller and rudder are integrated into a single unit to optimise hydrodynamic efficiency. A special hubcap is fitted to the propeller which streamlines the flow onto a bulb that is added to the rudder, effectively reducing flow separation immediately after the propeller. 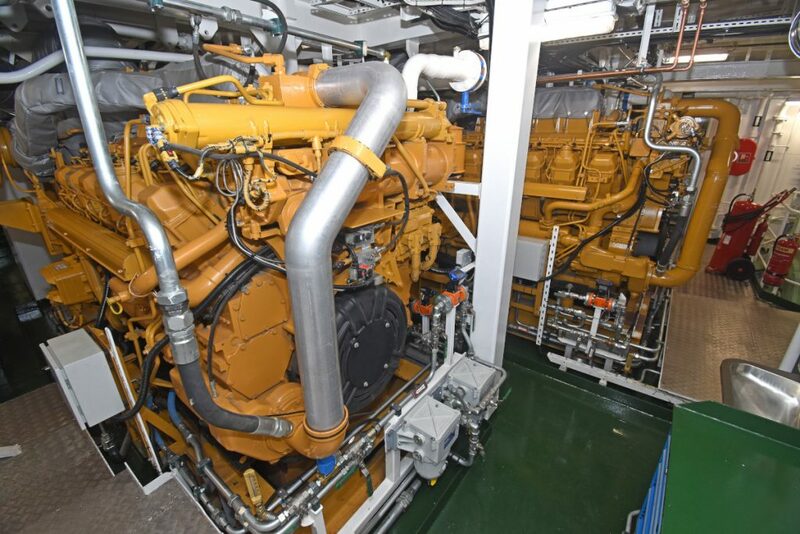 … and the two Caterpillar C3512C auxiliary engines that drive 1,644kWe Stamford 440V three-phase generators. The result is an increase in propeller thrust, as previously wasted energy is recovered from the flow. The addition of the bulb on the rudder also streamlines the flow aft of the rudder, further reducing drag. A twisted rudder provides further improvements in efficiency and maneuverability. In general, the efficiency gain is reported to be 3-8% for single-screw vessels. While steaming at full speed for four hours during Class endurance trials in the Norwegian fjords, Taits returned an average top speed of 19.5 knots. This is 1.5 knots more than Chris Andra, which features virtually the same propulsion machinery, with the exception of the Promas hub. 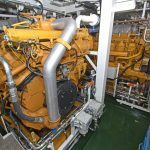 Further propulsion efficiency on Taits is delivered by the floating frequency (50-60Hz) of the vessel’s three-phase 400/440V electrical system. Driven by a PTO on the gearbox, the Rolls-Royce shaft generator delivers 2,700kW @ 1,200rpm, with the floating frequency enabling the main engine to run within the range of 620-750rpm. 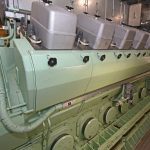 Additional electrical power on Taits is provided by two Caterpillar 3512C auxiliary engines (1,500kW @ 1,800rpm) running 1,644kWe Stamford generators. A Caterpillar C9.3 harbour genset of 250kW is located in the forepeak. 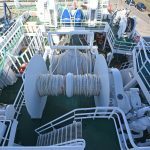 When Taits is hauling and shooting the midwater trawls, the gearbox PTO will be clutched in, enabling the shaft alternator to supply electrical power for the electro-hydraulic motors driving the winches and net drums. This arrangement reflects the fact that when full power is required for the deck machinery, there will normally not be the same demand for power on the main engine, allowing it to meet requirements for both the propulsion and hydraulic systems. 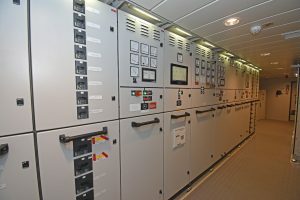 The vessel’s main electrical room. Four electric-drive hydraulic pumps power the vessel’s low-pressure deck machinery. Each 440V 60Hz pump is rated at 303kW. One pump has floating frequency, enabling it to still produce full power while running as low as 50Hz. 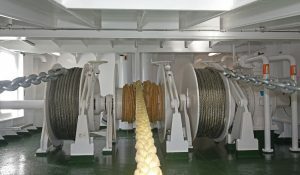 This yields further power efficiencies when the main winches are operating in auto-trawl mode as Taits is towing. A fully integrated high-pressure hydraulic system is used to operate the four Karm deck cranes fitted on Taits. 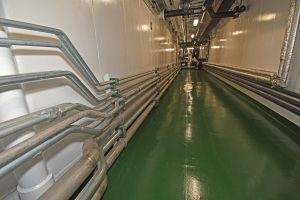 One plant, primarily servicing the deck cranes amidships, is located in a dedicated compartment forward below main deck level. 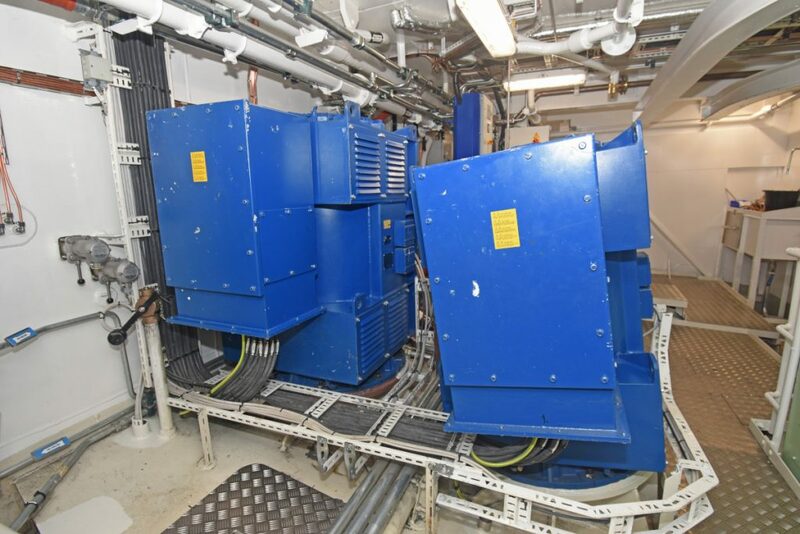 A further two are housed in a second room aft on the main deck, in close proximity to the cranes mounted on the trawl gantry. 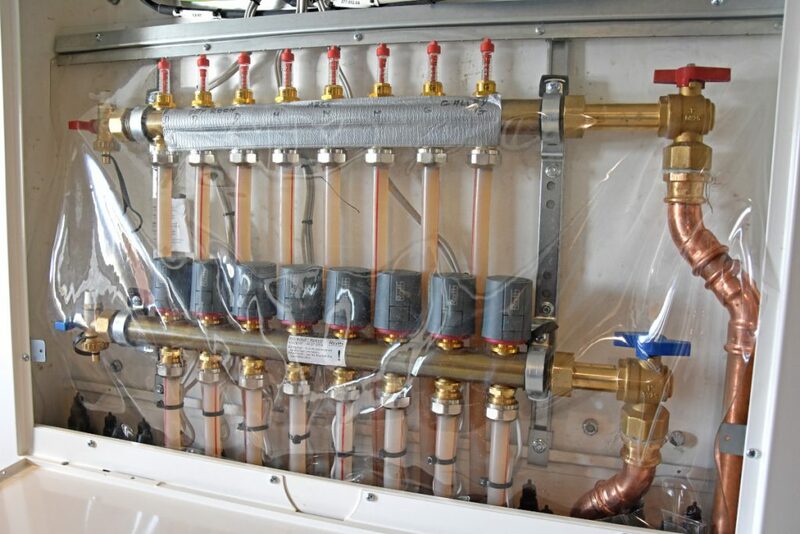 Stainless steel hydraulic pumps connect the forward system with the two aft, thereby ensuring that should one fail for any reason during a trip, full operational capacity can be maintained. 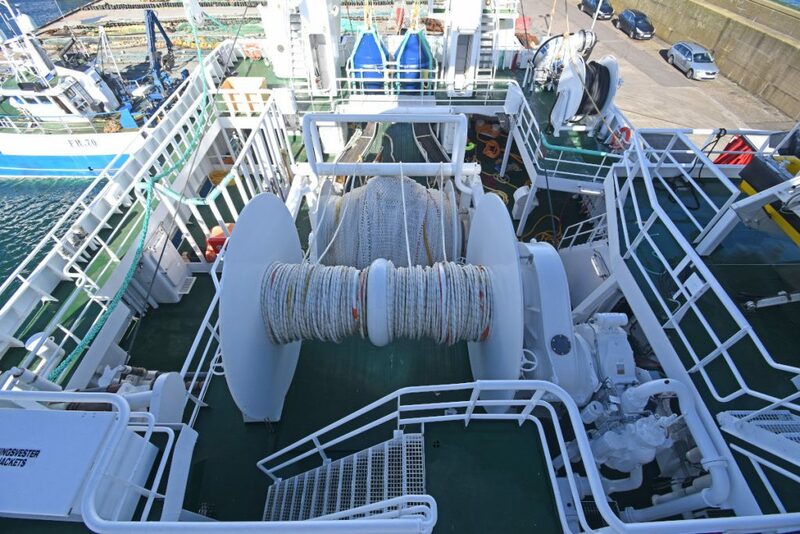 The length the owners and designers went to, in order to ensure optimum levels of operational efficiency into the future, is further shown by the presence of three Kamewa Ulstein side thrusters, rather than the customary two. 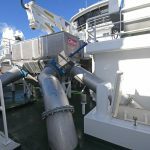 The need to provide maximum transverse thrust when manoeuvring Taits in confined areas was achieved by the installation of two stern thrusters of 560kW. This brought the advantage of two smaller-diameter tunnels being easier to fit into the hull aft than a single larger tunnel, together with higher levels of efficiency. A 900kW thruster is fitted forward. … from which pipes run to the forward system, and vice versa, to give full duplication at all times. 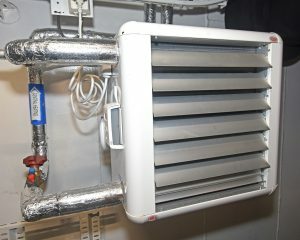 The insulated recycled hot water pipes are on the starboard side of the passageway. 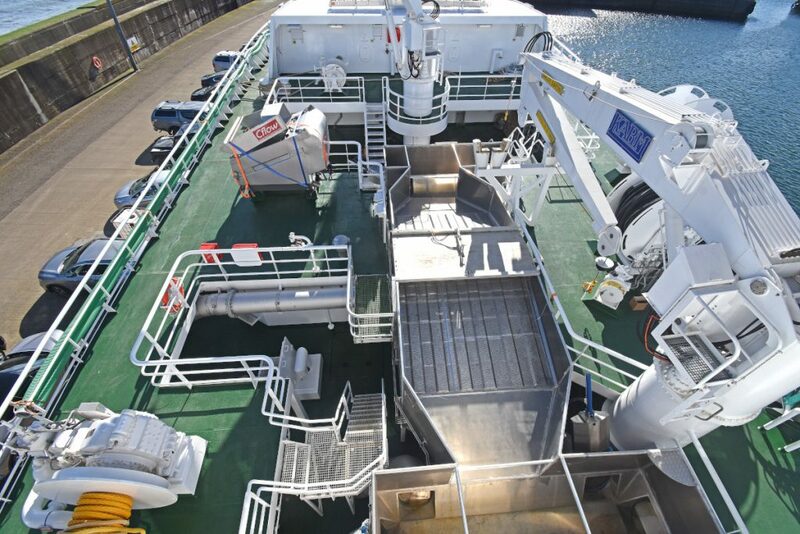 The combination of double bottom and deep fuel tanks allows 535,000 litres of fuel to be carried. 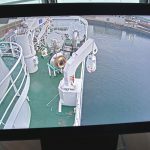 The vessel’s domestic freshwater capacity is 50,000 litres. Engineers Stephen Rennie, George Maitland and Steven Beagrie monitor the performance of all the vessel’s propulsion and generating machinery, the catch storage, and the comprehensive alarm systems from a separate soundproofed control room and office, when sharing 24-hour watch duties, during which all functions onboard Taits are constantly monitored through the all-embracing Rolls-Royce Acon vessel management system. 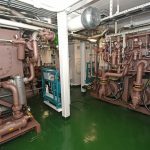 The full package of Rauma Brattvag deck machinery installed on Taits was supplied by Rolls-Royce AS. Two net drums are arranged in waterfall style on the centreline. 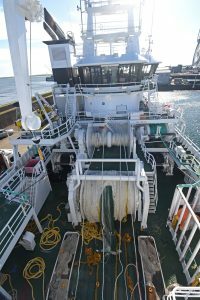 The two 95t core-pull split trawl winches are mounted on the shelterdeck close to the sides of the hull, positioned either side of the centreline abaft the accommodation casing on the boat deck. 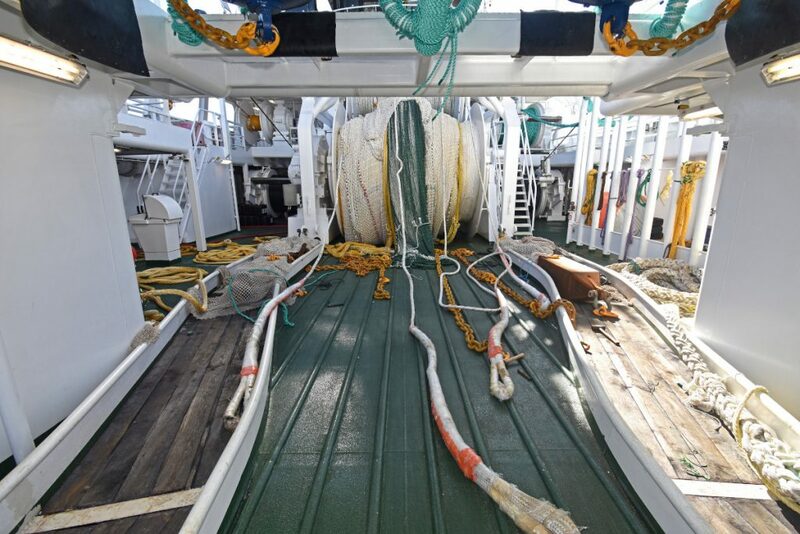 Each winch is spooled with 2,000m lengths of 38mm-diameter Bridon Starfish wire, supplied by Jackson Trawls and taken to Ølensvåg aboard Chris Andra towards the end of 2018. 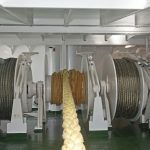 Controlled through a new Rolls-Royce Synchro X7 autotrawl system, the trawl wires have straight leads to inboard hanging blocks suspended on the underside of the stern gantry, to which companionways give ready access. 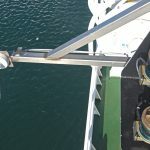 This arrangement ensures that the crew have clear and immediate access to the midwater gear from two levels when clipping on/off helper pennants and backstrops. 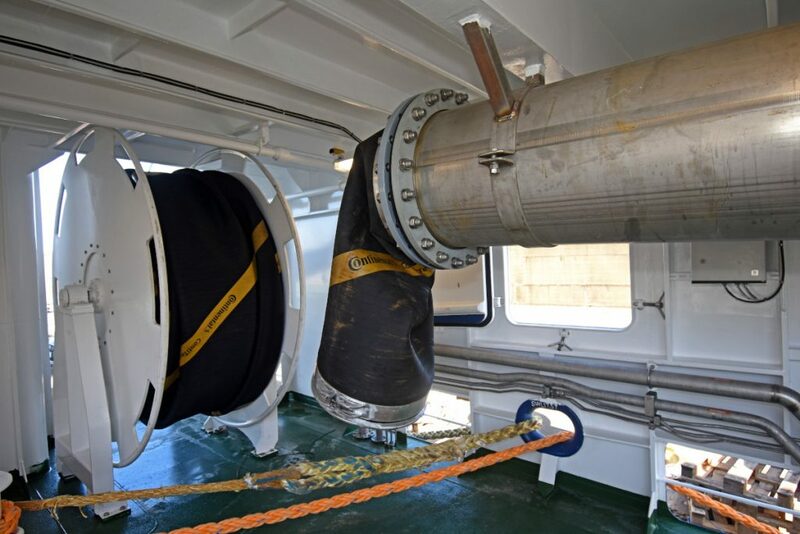 Anchor and mooring winches are housed in a dedicated compartment on the foredeck. 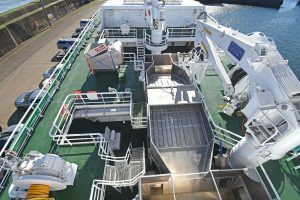 Integrated into the stern construction of Taits, the two-level trawl gantry also accommodates lifeline and tail-end blocks, together with two knuckle-boom deck cranes and the net-sounder winch. 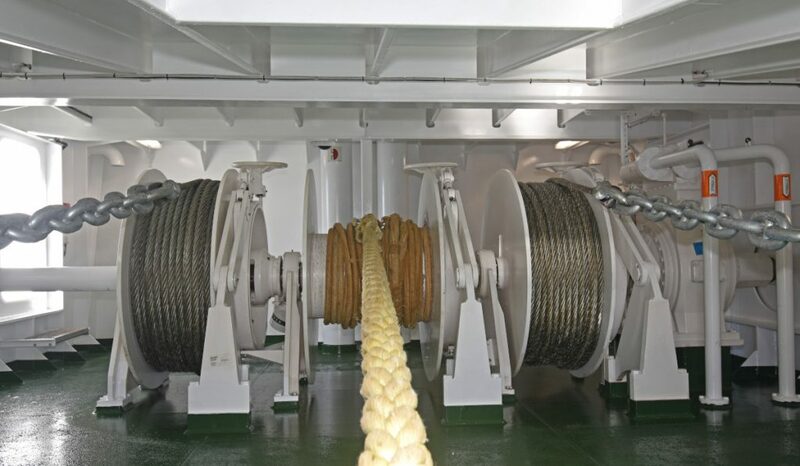 Midwater trawls are worked from two 110t net drums positioned centrally at shelter and forecastle deck level in waterfall style above a single set of toe-end weight tracks, the bottoms of which are clad with hardwood for optimum skid factor. A large-diameter roller, positioned above the lower drum, comes into play when shooting and hauling the trawl off the slightly higher forward net drum at the head of the trawl deck. Timber-lined toe-end weight racks serve the central net drums. 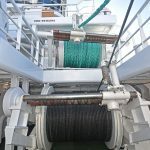 A 70t lifeline winch for handling the bag is located on the starboard side of the forecastle deck, aft of a 50t midline winch. A 50t tail-end winch, used for pulling the bag to the stern before the sock is taken up and attached to the aft fish pump, is positioned in a similar location to port, in line with a dedicated sheave mounted within the mid-height trawl gantry. 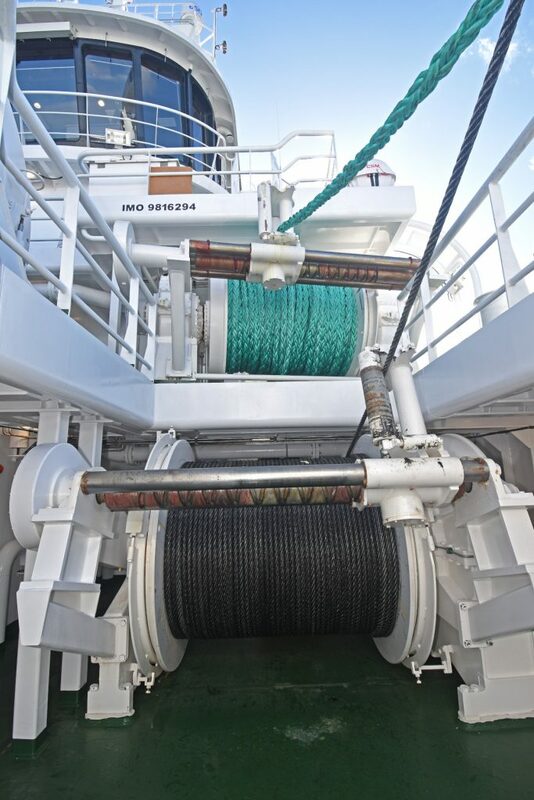 A second 50t tail-end winch, positioned at the foreside of the deck casing, comes into play when fish are being pumped amidships. 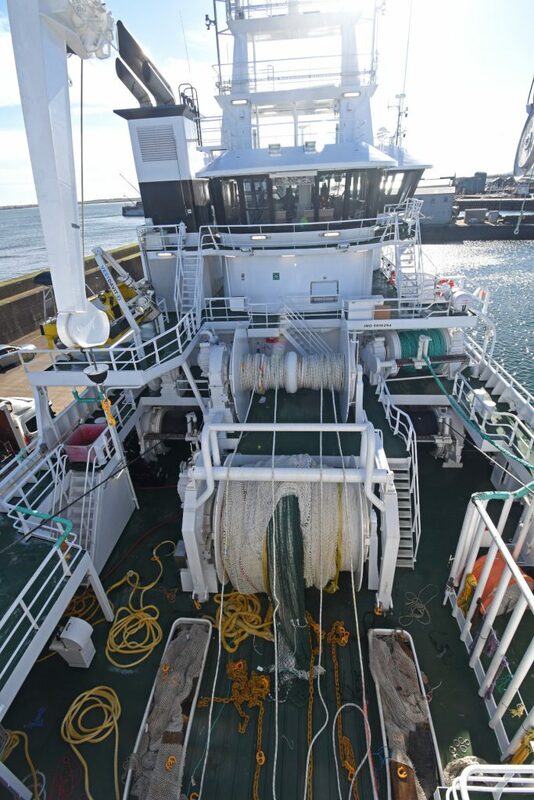 Two outhaul winches are mounted aft on the wrap-round forecastle deck under the stern gantry, for use when shooting away the bag and other duties on the trawl deck. When fishing in poor, heavy weather, the central opening through which midwater trawls are worked can be sealed off by raising a hydraulically operated gate, positioned aft of the four customary guiding-on pins. 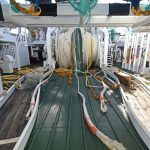 At the end of a successful midwater tow, hauls of pelagic fish can be pumped aboard Taits either over the stern, or on the starboard side amidships. 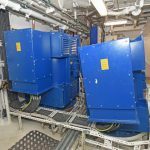 The decision to have two pumping stations was taken by the owners as part of their policy to maintain maximum duplication of key systems throughout the vessel, in order to enhance fishing efficiency and crew safety. 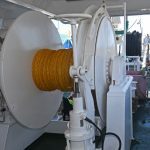 When pumping aft – which is a first for the skippers and crew of Taits – as is customary, the net drum will be used to dry up the brailler before the 57t tail-end winch, mounted to port on the forecastle deck, is used to haul the bag back to the quarter, before the sock is attached to the pump, located just forward of the trawl gantry. 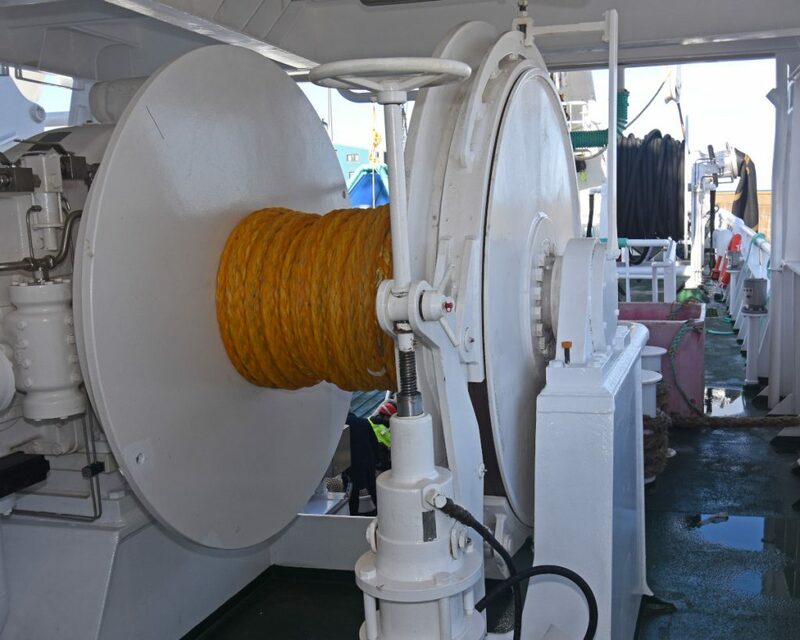 The reel on which the hydraulic pipes are stored is positioned forward of the fish pump on the port side of the forecastle deck, directly above the larger-diameter reel on the shelterdeck from which the fish hose is worked. … with the flow of fish controlled from the deck house. 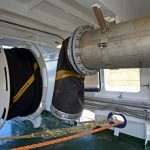 The fish hose, permanently connected to the pump, lies in a deep vertical slot in the port side of the transom, allowing the hose to run clear of the stern as the pump is lowered into the water by the dedicated overhead crane. 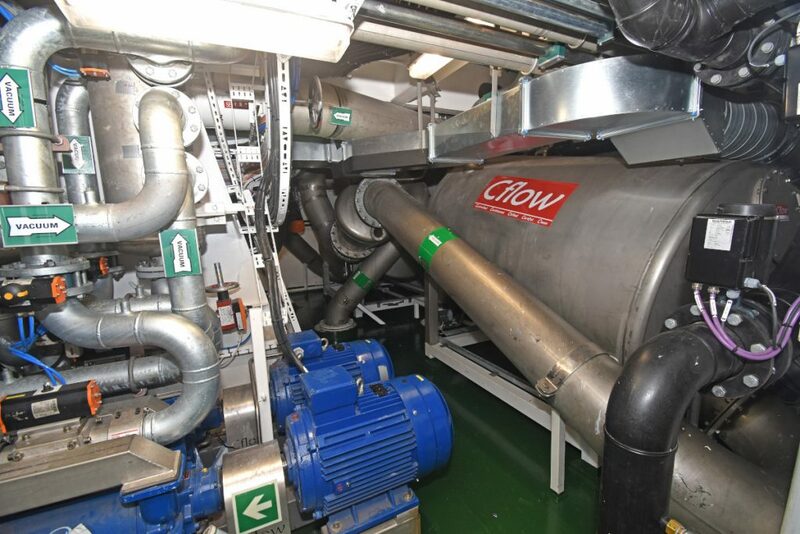 When the rubber hose is connected, fish are pumped some 35m forward, through a large-diameter stainless steel delivery pipe, inboard towards the C-Flow fish/seawater separator system. 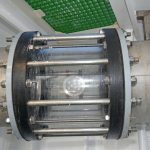 A short clear Perspex section (the looking glass) is incorporated into the first section of the main pipe. 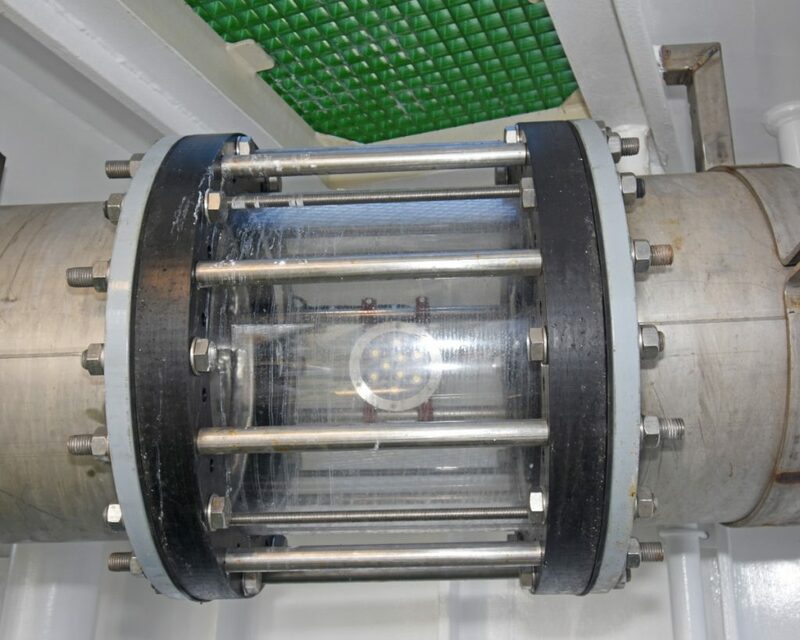 This enables the crewman controlling pumping operations to constantly monitor the flow of fish, aided by the presence of an LED light mounted on the inside of the clear section to enhance visibility in all operational conditions. 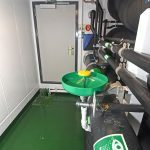 When pumping, the flow of pelagic fish from the separator into the 11 RSW tanks is remotely controlled from the pump room located in the deckhouse. 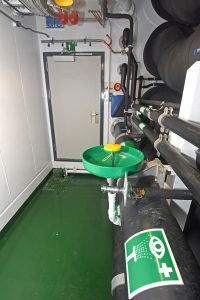 On entering the water separator, fish are directed upwards, before sliding either forward or aft into transverse troughs, from which they are directed to the allocated RSW tank by remotely operated vertical gate valves. 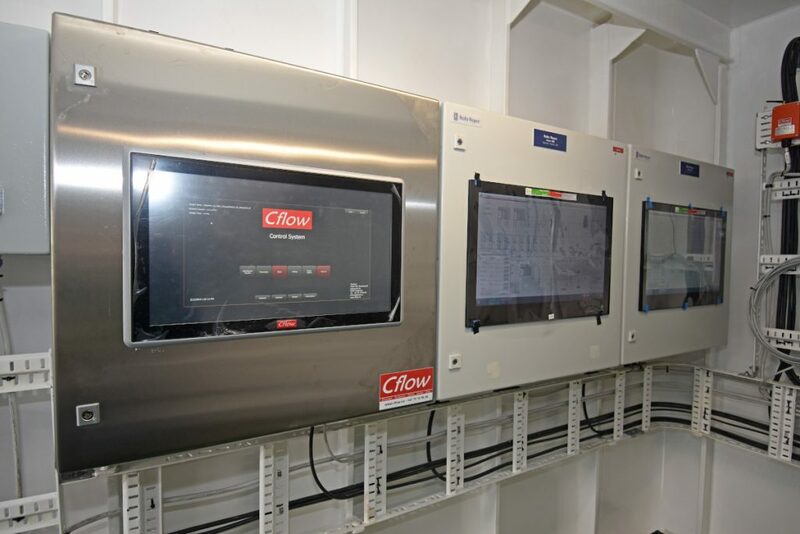 Two shower systems and an eyewash station are arranged immediately outside the refrigeration plant room for maximum safety. The 11 RSW tanks on Taits have an internal volume of 2,200m³. 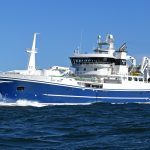 This ensures that optimum levels of catch quality will be delivered on each trip, with the vessel’s skippers and engineers having maximum flexibility in selecting the ratio of fish to seawater at all times. 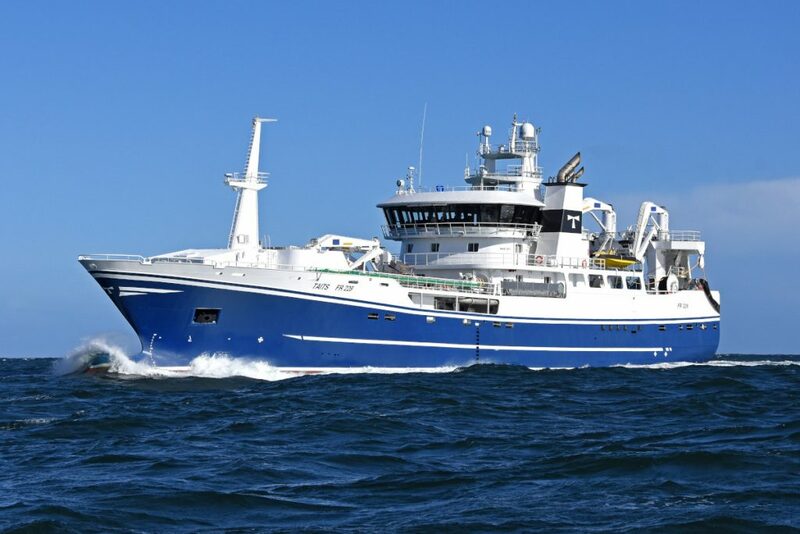 With buyers worldwide requiring ever-higher standards of catch quality, the owners have put a strong emphasis on landing a top-quality product by being able to reduce the temperature of pelagic fish entering the RSW tanks down to an optimum storage temperature of between 0°C and 1°C as quickly as possible. 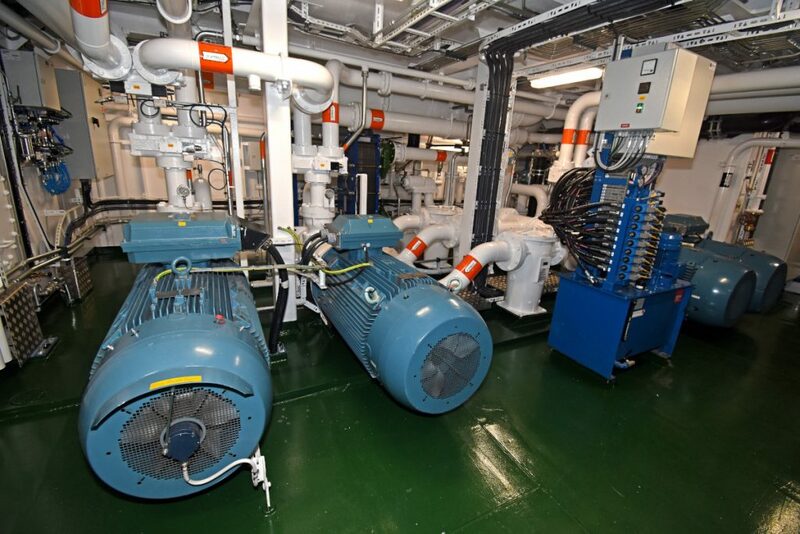 Two ammonia-based refrigeration plants, supplied by FrioNordica AS, deliver 2.2Mkcal/h of cooling capacity, enabling pelagic catches to be brought down to the desired level in often less than two hours, depending on the quantity of fish pumped aboard and the number of RSW tanks brought into use. 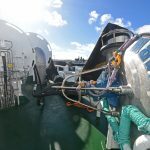 Fish quality is further enhanced by circulating purified seawater, supplied from a Normex ozone plant, through the 11 RSW tanks when the vessel is steaming, before the next shot of pelagic fish is pumped aboard. Two ammonia-based FrioNordica refrigeration plants each deliver 1,300kW of cooling capacity. 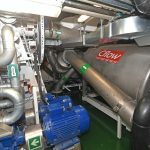 Pelagic catches from Taits are discharged to processing factories ashore by a twin C-Flow 4,200-litre vacuum pumping system. Using 4 x 64kW vacuum power packs, the system has a discharging capacity of up to 2 x 150t per hour. 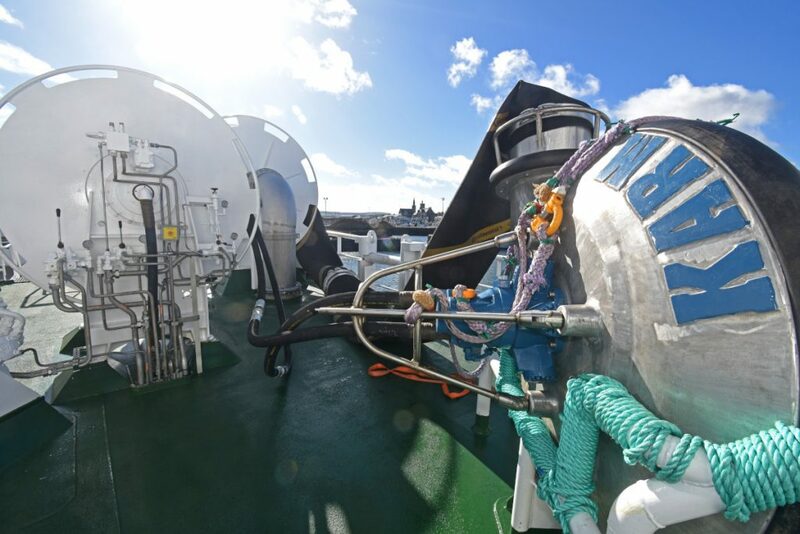 The distribution of pelagic fish into the RSW tanks, through tank sounding, pump and valve control when pumping, is just one of the functions performed by the Rolls-Royce Acon vessel management system. The comprehensive touch-screen control panels positioned at key locations on Taits monitor all aspects of onboard management, including the performance of the main and auxiliary engines, electrical supply and distribution, alarms, fuel/oil capacities and transfer, trim and electrical loading. Taits has the distinction of being the first vessel in the Scottish fleet to feature a fully integrated central heating system that utilises hot water recycled from the main and auxiliary engines. 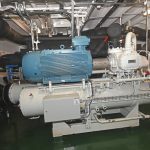 The owners took the decision to incorporate the system after hearing good reports from the owners of the first Norwegian pelagic vessels to use heat recouped from engineroom machinery to warm all internal areas. 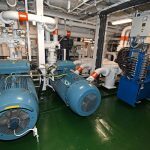 The additional upfront costs associated with the environmentally friendly system will generate long-term savings in terms of reduced fuel costs, as well as reducing the vessel’s carbon footprint. 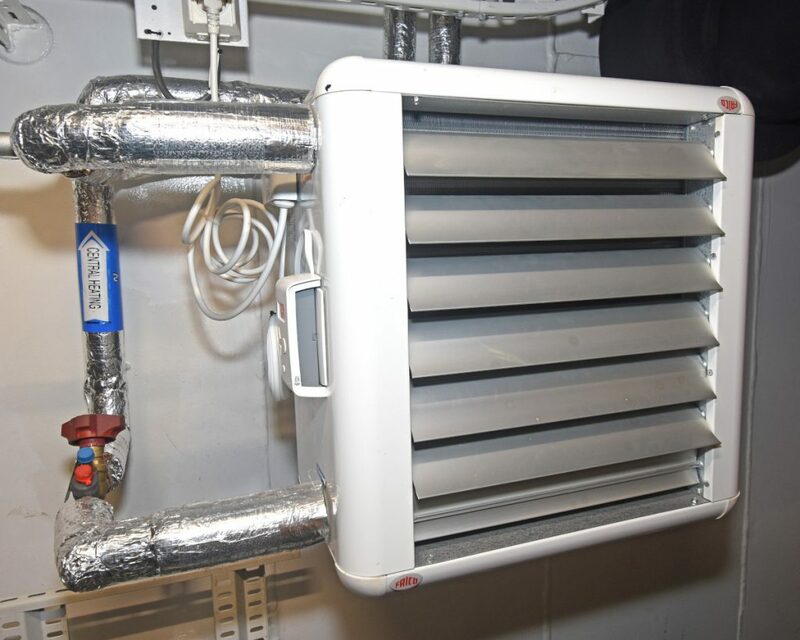 … that distribute recycled hot water to fan units installed in every compartment on Taits. 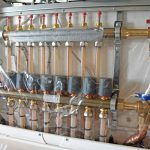 Hot water recovered from the main and auxiliary engines is circulated throughout the vessel using small-bore copper piping originating from strategically placed heating manifolds. 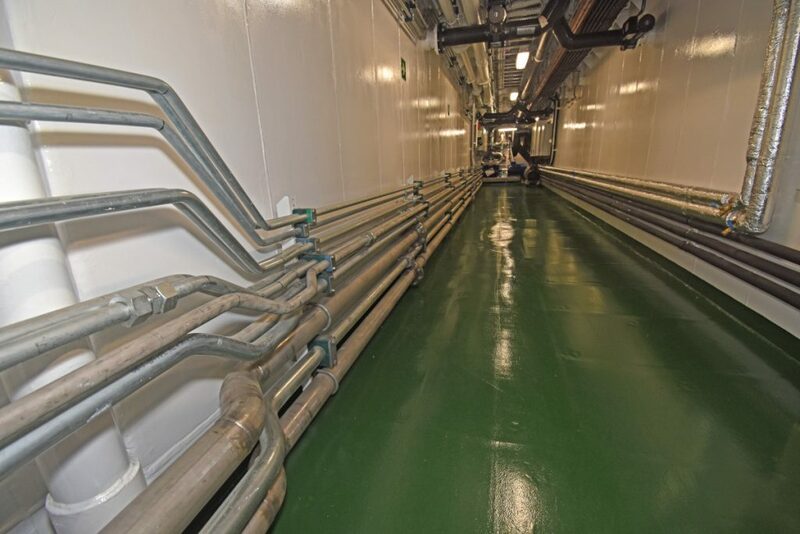 In addition to supplying underfloor heating throughout all the internal accommodation areas, recycled hot water is also piped to compact fan heaters fitted in every machinery compartment and store throughout the vessel, including the forward thruster and sonar room. 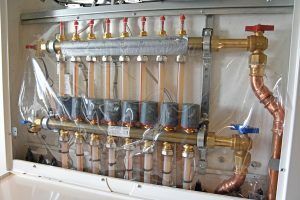 By eliminating the risk of condensation, the constant flow of warm air throughout the vessel will bring additional long-term savings in the form of reduced maintenance costs across a wide range of ancillary equipment. 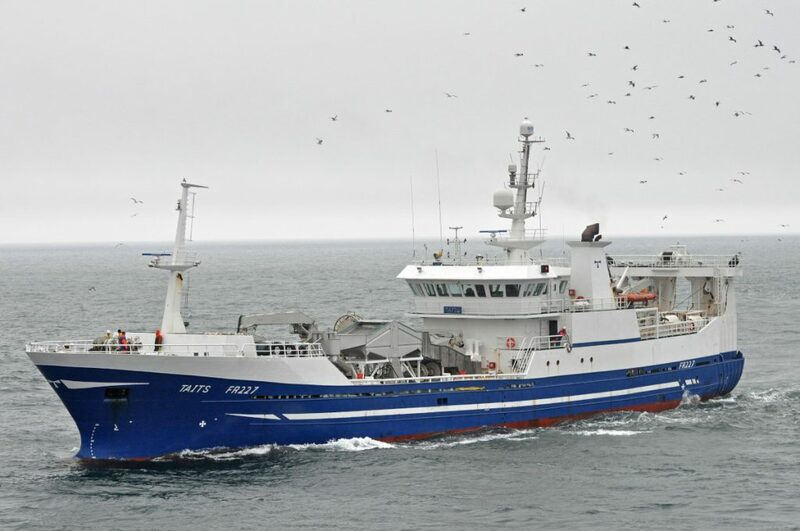 Taits uses a ScanBas 365 catch-/net-monitoring system, supplied and installed by Scanmar UK Ltd of Peterhead. 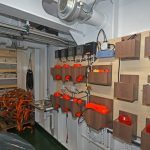 Scanmar sensors and chargers in the deck house off the trawl deck. 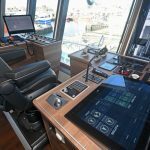 A combination of wide digital receivers (WDRs) and the latest 365 software allows the sensors to be configured from the multi-display units in the wheelhouse, from the charging station in the trawl deck. 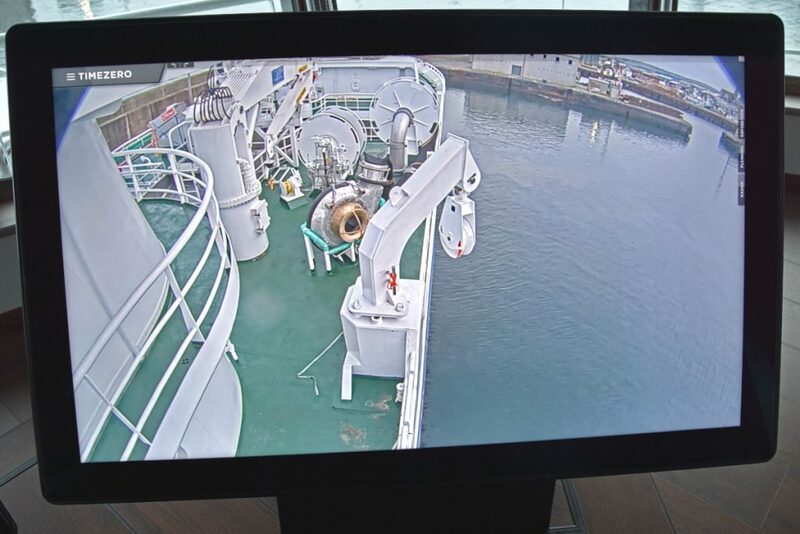 A Trawl Eye sensor, mounted on the tunnel, provides continually updated information on the location and movement of fish towards the brailler, on which five SS4 super-catch and angle sensors are mounted along the full length for fast update when the fish move down. The angle function also lets the skippers continuously monitor the pitch and twist of the bag. Sensor signal reception while trawling is collected from four H4B30X50 single-beam hydrophones mounted on both port and starboard blister housings. 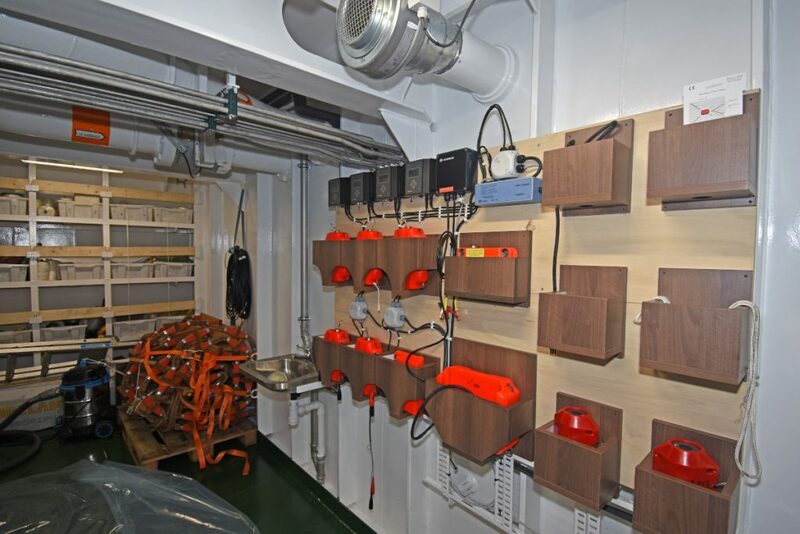 Four QBC-X1 charging units are mounted in a readily accessible store forward of the trawl deck, along with the new 365 Sensor Configurator Unit (SCU), which allows the sensors to be configured from the 365 software in the wheelhouse. Bruce Hardy of Furuno UK demonstrates how to programme course plotting on the MaxSea TimeZeros, while sitting on the lower-level seat. 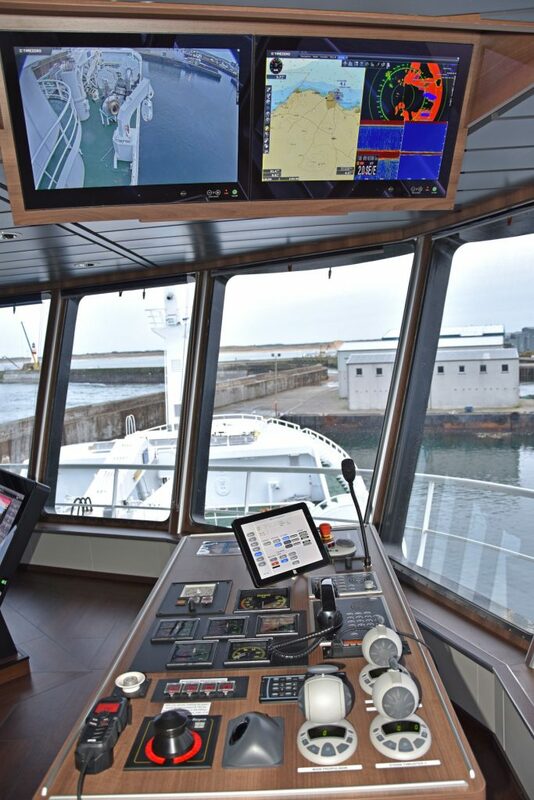 Taits is the first vessel in NE Scotland to feature a Furuno big bridge system, in which five 55in 4K Hatteland floor-mounted tilting screens and 15 26in Hatteland fixed screens display all the bridge equipment, including sonars, radars and echosounders, in different configurations depending on the job the vessel is undertaking. It is driven by an advanced video wall controller integrated into a touch-screen command and control system. The skipper can select steaming, searching, fishing and harbour modes, and the bridge will automatically reconfigure to the required layout. 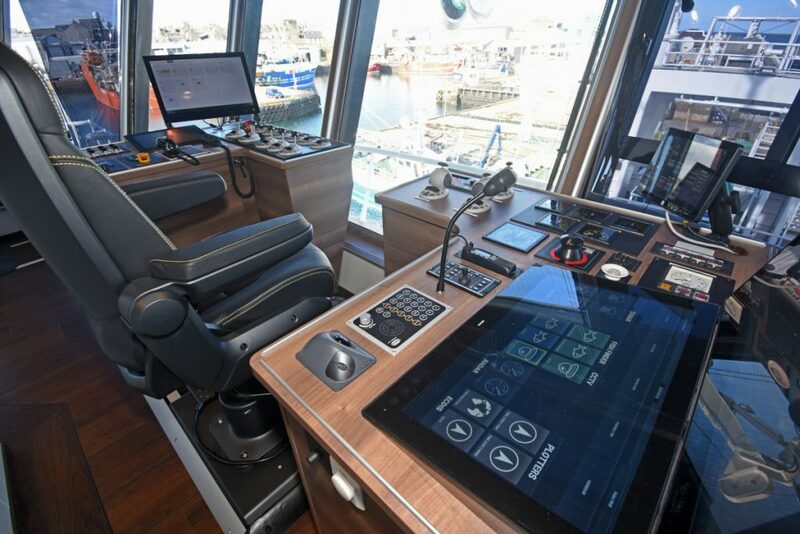 Three 24in touch-screen command centres are located on the port and starboard console, and aft at the winch controls. 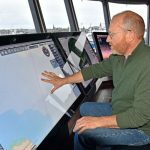 From here, the skipper can use a single trackball or touch screen to control all the navigation and fishing equipment on the vessel. 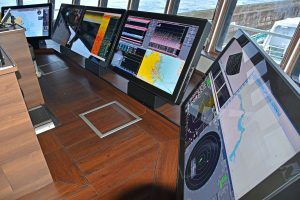 The touch screen has soft-touch controllers that copy the radar, ECDIS and sonar keyboards, allowing them to be mounted out of sight to keep the bridge clean and uncluttered. The starboard wing console and customised overhead displays. 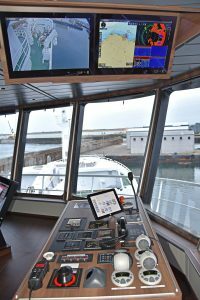 Three NE Scotland companies, Furuno UK, Woodsons and Scanmar UK, supplied a comprehensive package of electronic navigation and fishing equipment, which is installed in a separate instrument room directly below the wheelhouse. Two racks contain 10 separate computers, while eight bespoke radar, sounder and ECDIS processors are networked into both the Furuno control system and the Furuno video wall display system. 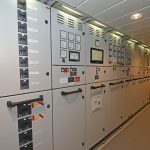 Backed by three independent redundancy power supplies, the video wall controller takes in all the images from the equipment, and allows everything to be displayed anywhere on the bridge. 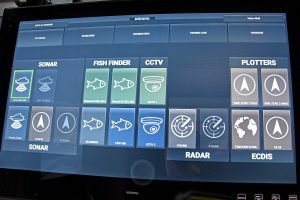 During searching, the 55in displays can be put to their full advantage, displaying full-screen high-resolution (4K) sonar images. 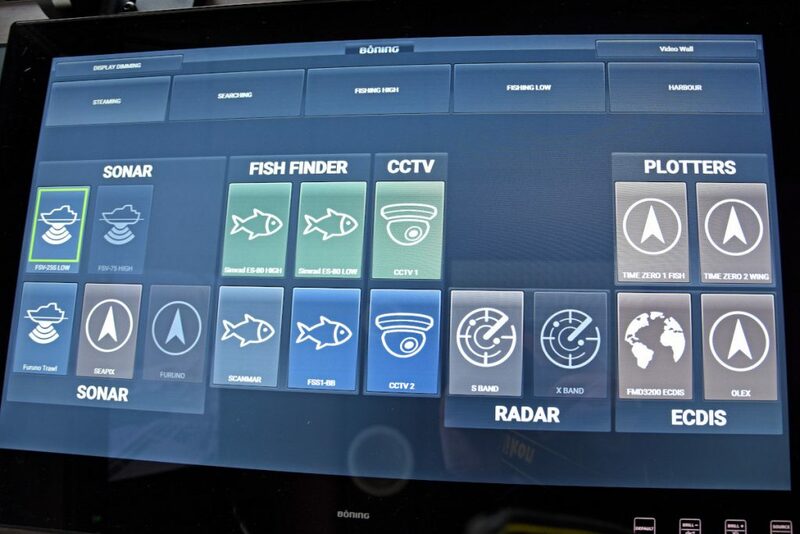 This layout can be changed with one touch to show split-screen CCTV with radar chart overlay and conning information, for steaming or entering harbour. 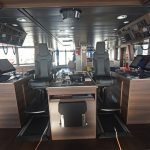 The 85km of electrical cabling that is installed on Taits highlights the high level of technology now commonplace on this class of vessel. 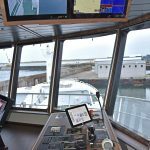 Located three levels above the forecastle deck, the virtually circular wheelhouse provides a commanding 360° view through the full-height windows. The Furuno big bridge system is located in front of two NorSap 2000S skipper’s chairs, positioned between wing and island consoles, which together form the main navigation position. 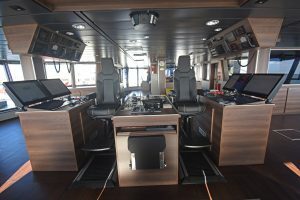 The main fishing and navigation consoles. Freestanding wing consoles, for use when Taits is being manoeuvred in confined areas, are located at the forward corners of the wheelhouse. The overhead screen display above the wing consoles can also be configured to skipper Willie or Peter’s individual preferences. 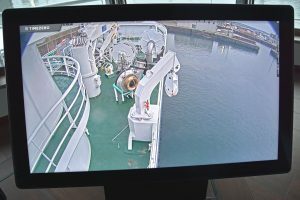 This includes the images from CCTV cameras mounted on pivoting arms either side of the wheelhouse that enable the skipper to accurately view Taits’ position relative to quays and other vessels when berthing. 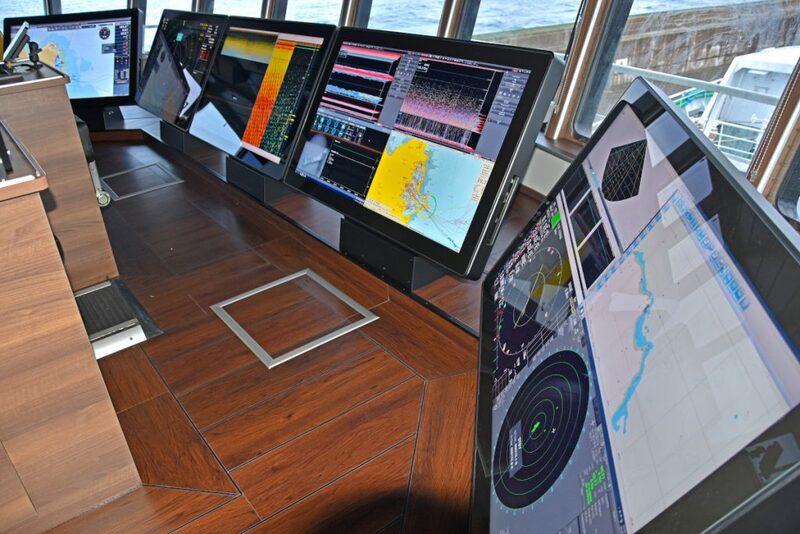 The central fishing console aft provides a commanding view of midwater trawling activities across the stern, while radar, sonar, trawl monitoring and chart information can be viewed and controlled on the upper four 26in Hatteland displays. Three 24in touch-screen controllers enable the operator to quickly select preferred displays in relation to Taits’ prevailing mode of operation. A relaxing day area is arranged to port, forward of a glass-screened office area. For long-range fish detection, Taits is equipped with the latest-model low-frequency omni-sonar from Furuno. 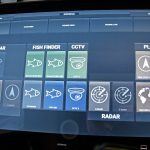 The FSV-25 has a narrow vertical beam, allowing echo detection at very long range, and also using a unique dual-range function where one sonar can effectively become two with independent control of range, tilt and gain on each screen. 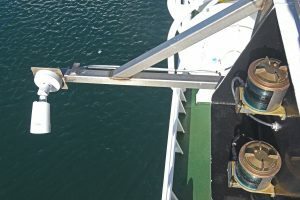 For medium- and close-range echo detection, skippers Peter and Willie Tait use Kaijo KCH-5885Z 360° medium-frequency 94kHz sonar and Furuno FSV-75 high-frequency (164kHz) sonars, providing excellent clarity on smaller marks coming off the bottom. 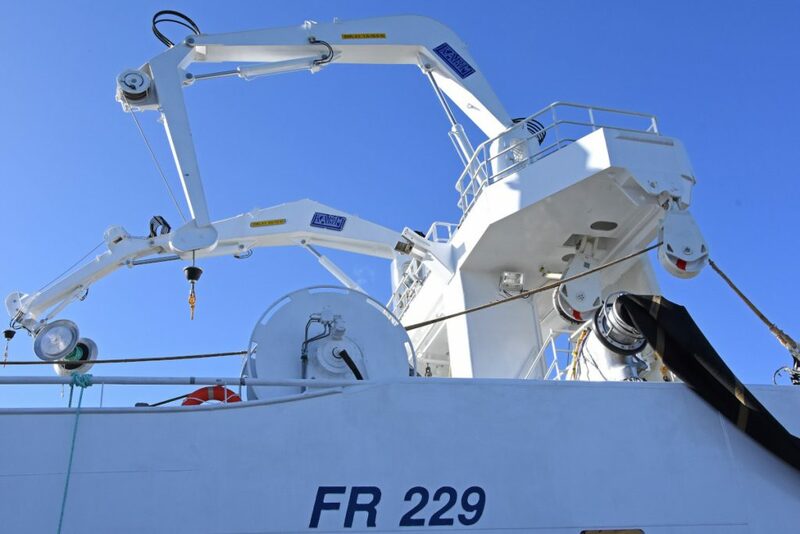 Vertical echo detection is performed by two Simrad ES-80 sounders (38kHz and 200kHz) and a Furuno FSS-1BB fish-species discrimination sounder. Sweeping through a broad range of frequencies, this unit calculates the breakdown of species types in any given shoal, and provides graphical information to the skipper to help ensure that only the target species actually ends up in the net. Taits is also equipped with a SeapiX 3D multibeam sonar. SeapiX gives both the key advantages of omnidirectional sonar and those of sounders, while at the same time providing completely new functionalities to skippers, including enabling them to see the actual shape of a mark. 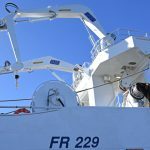 Net-monitoring technology is provided by Furuno, with an onmidirectional TS337A trawl sonar and 4 x Furuno catch sensors. 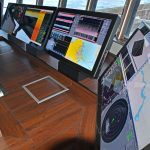 The high level of electronic equipment fitted is further highlighted by the presence of a Furuno FMD-3200 electronic chart display and information system (ECDIS), supplied by Furuno UK of Fraserburgh. Providing fast, intuitive course-planning and navigation monitoring, the ECDIS unit, for which Thomas Gunn of Poseidon Navigation Services, Buckie, will provide updated electronic charts every month, is supported by two type-approved Furuno chart radars – FAR 32310-BB X-Band and FAR 3210-BB S-band. 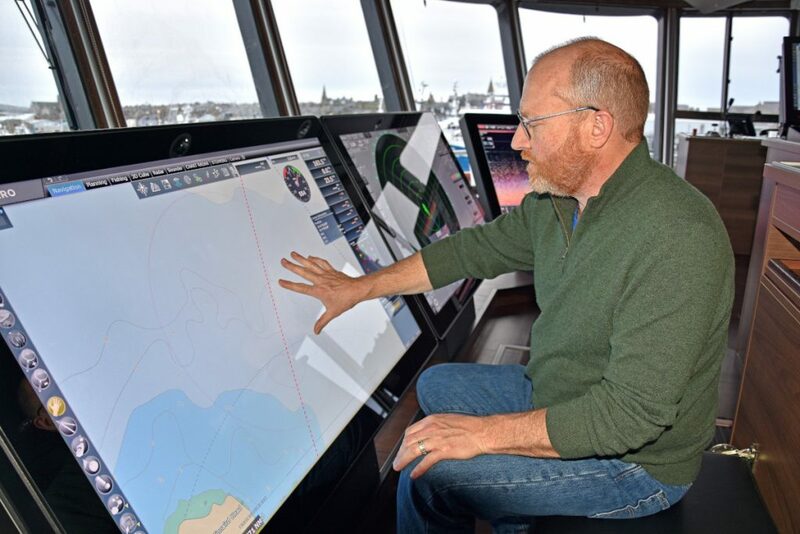 Navigation equipment includes two MaxSea TimeZero chart plotting systems with integrated sounder, radar and camera packages, and an Olex 3D seabed mapping plotter. 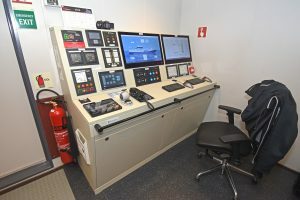 Course plotting on the MaxSea TimeZeros can be programmed by the skipper sitting on a lower-level seat in front of the central 55in touch-screen display. GPS and heading data is provided by two Furuno GP170 type-approved GPS receivers, Furuno SC-70 and Vector satellite compasses, a Simrad GC80 expanded gyro system, and a Simrad Pro AP80 autopilot system. AIS information is handled by the latest-model Furuno FA-170, and a Furuno CI-68 BB current indicator provides tidal data at five different depths, passing this information to the long-range sonars. A Furuno BR-500 watch alarm system gives peace of mind to the skipper and crew when Taits is steaming to and from the fishing grounds. 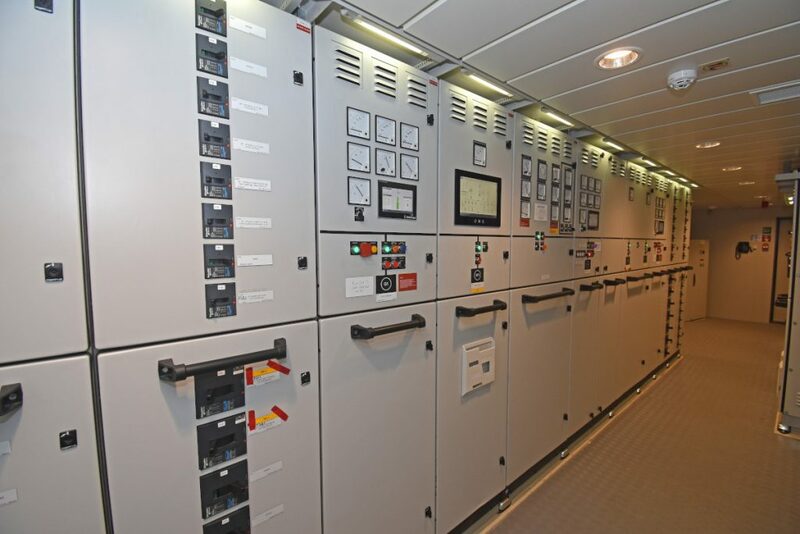 The vessel’s extensive communications system includes a full Sailor GMDSS package. 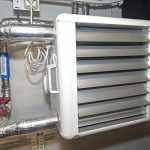 Jotron EPIRBs and SARTs are also fitted. Man-to-man communication when Taits is fishing is handled by Icom UHF units built into the Geko protective helmets worn by the crew during fishing operations. 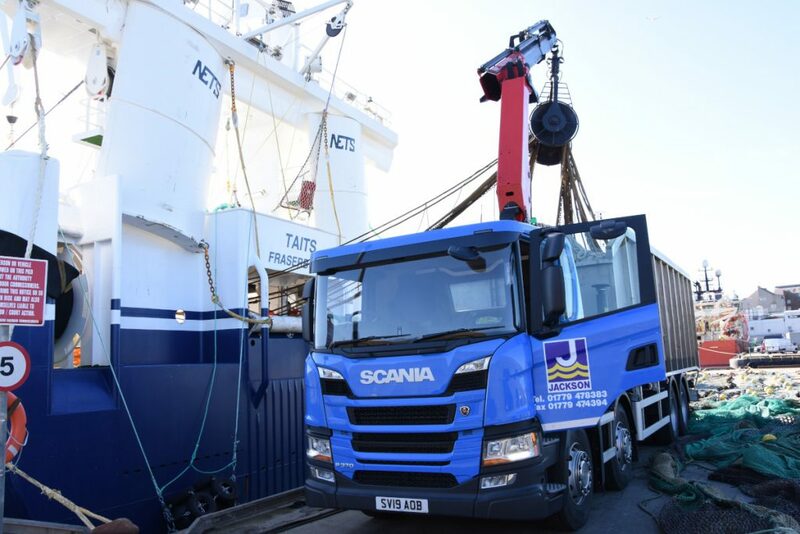 Jackson Trawls supplied a complete package of midwater gear to Taits. 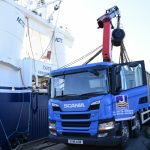 Peterhead netmaker Jackson Trawls continued its long association with the Klondyke Fishing Company Ltd by supplying a complete package of midwater fishing gear to Taits. 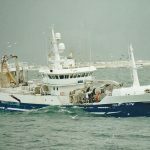 This extensive order included four new blue whiting, herring and mackerel nets, together with associated braillers, illustrating the consistently high level of performance the skippers achieved with similar midwater trawls onboard Chris Andra. 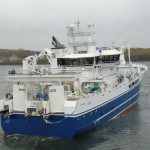 The first of the new nets to be used by Taits was a 2,050m blue whiting trawl, made by Jacksons to a new in-house design with a eight-panel tunnel. This is 650m in length and incorporates 32m mesh in the mouth that is constructed from Jacinto twine. Consisting of polyethylene-covered nylon, Jacinto twine has become popular with pelagic skippers and crews since it was first used by Jacksons a few years ago, shooting cleanly and quickly off the net drums with no sticking from the large meshes. Two of Jacksons’ midwater nets wound on the drums. Jacksons also made two heavy-duty blue whiting braillers featuring 48mm-diameter choker straps. A 67m bag can take over 600t, and the 77m brailler over 900t. 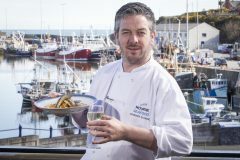 The blue whiting gear was reported to have performed well from the first shot when Taits was fishing in heavy weather last month, some 100 miles west of Ireland. 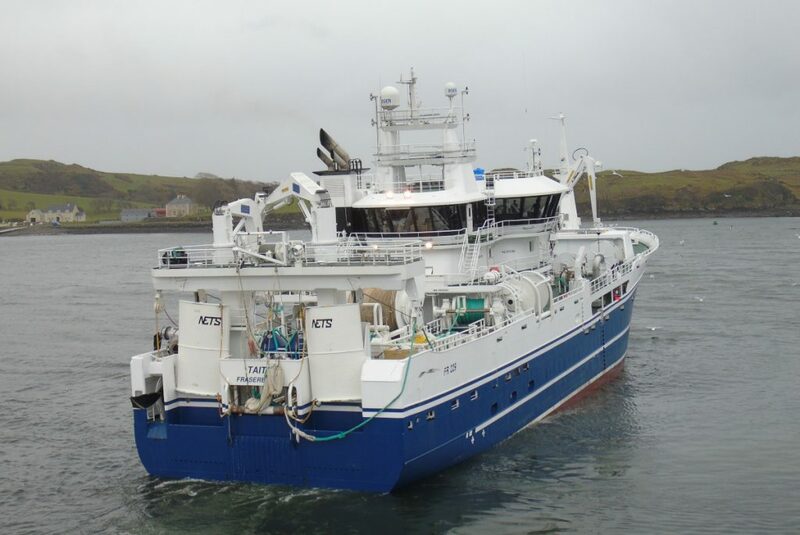 When the North Sea herring season starts in July, Taits will use a new 1,050m herring trawl. This was a repeat order by the skippers, as they are comfortable and familiar with the design. Made with braided nylon, the net has 12.8m meshes in the top sections and 6.4m in the bottom. A larger 1,300m midwater trawl, primarily designed as a dual-purpose mackerel/scad net, also has the potential to be used for fishing herring. With 25.6m meshes in the upper sections and 12.8m in the bottom, the mouth of this net is constructed with Jacinto twine. Small-mesh sections are incorporated right down the ropes and in the bottom of the belly. 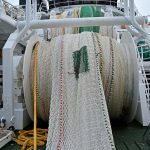 The biggest net that Jacksons made for Taits is a 1,400m mackerel trawl with 25.6m meshes in the mouth and smaller mesh inserts round the frame ropes. Boat mackerel nets have eight-panel tunnels. 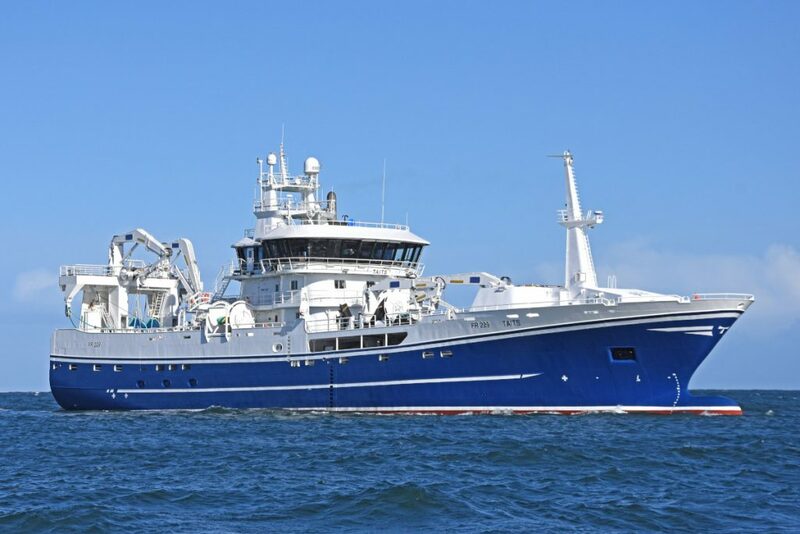 Jackson Trawls also supplied two 80m mackerel braillers to Taits, one of which has T90 mesh in the top, and the other diamond mesh along the complete length. Incorporating eight panels along their full length for better flow, the heavily constructed bags are made to a new and slightly wider design, giving greater internal volume geared to pumping pelagic fish at the stern. 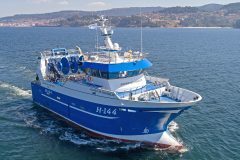 Taits is using a set of NET Systems multipurpose Deepwater Lites midwater trawl doors with a surface area of 14m² to spread the blue whiting, herring and mackerel midwater trawls. Having fished successfully with similar doors, the skippers opted for the same again. 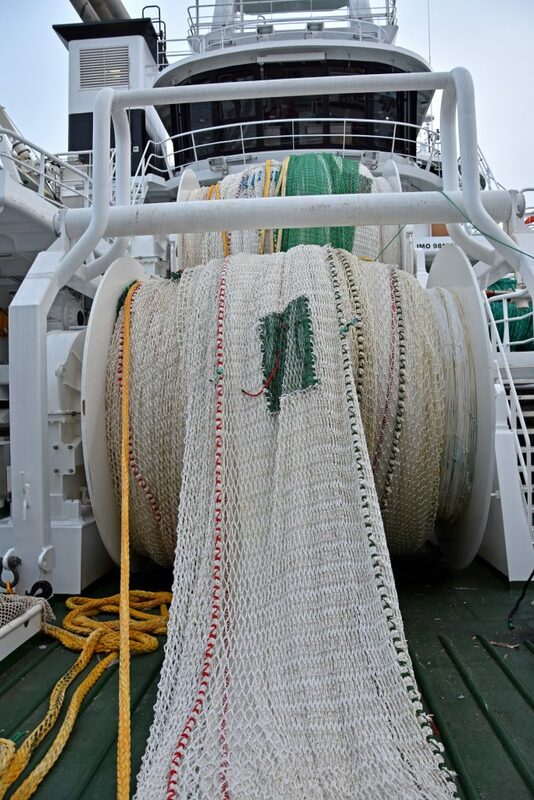 Jackson Trawls also supplied two 2,000m lengths of 38mm-diameter Bridon Starfish trawl wire to Taits. 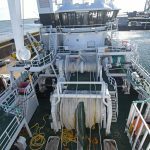 A full package of 100m Lankoforce-covered 36mm-diameter Dyneema sweeps for the four midwater trawls also came from Jackson Trawls, together with a 500m 10in-diameter polysteel lifeline. The first Taits, heading in to land at Peterhead. 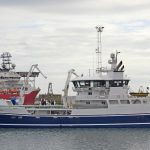 Taits is the latest in a long line of pelagic vessels to be built for the Tait family and their Fraserburgh-based Klondyke Fishing Company Ltd. The new boat is also the third Taits. 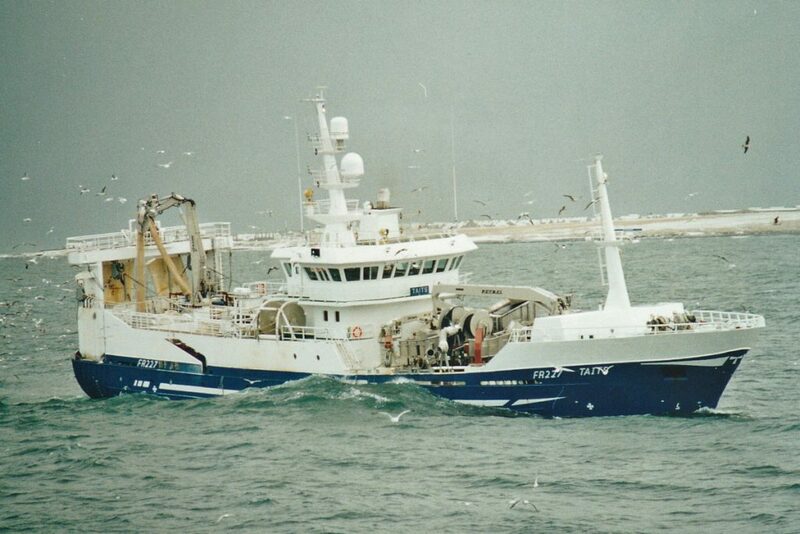 The first was the 136ft purse-seiner/trawler Taits FR 229, built in Norway in 1978. 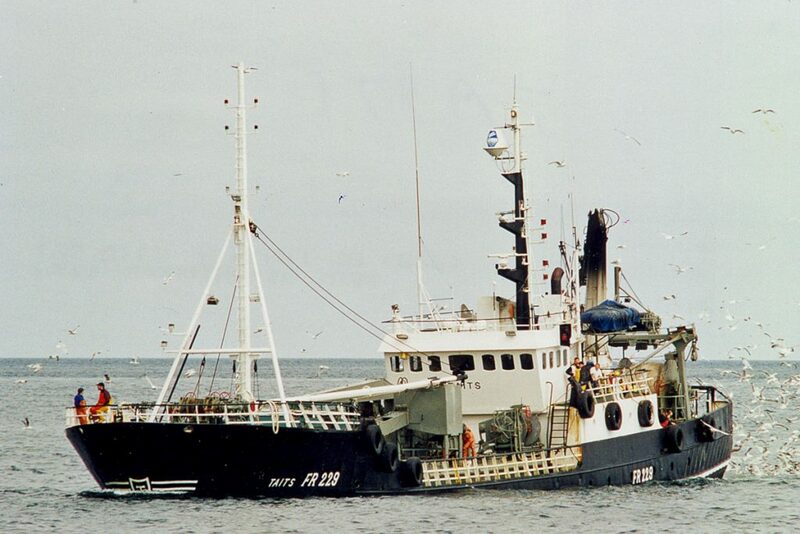 This fully shelterdecked vessel fished blue whiting, herring and mackerel from Fraserburgh for 23 years, during which time it was lengthened by 26ft and fitted with three additional RSW tanks. Taits was one of three second-generation pelagic vessels to be built for the Tait family in the mid-1970s, Andra Tait FR 226 and Chris Andra FR 221 being the other two. 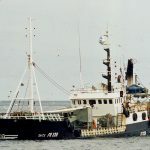 These vessels replaced the first-generation purse-seiners Conquest FR 1, Challenge FR 77 and Comrade FR 122 that were built over a period of five years from 1968, when the family initially replaced the Forbes-built drifter/seiner Fertile FR 305. The second Taits FR 227, a 61m vessel primarily rigged for midwater trawling, although also featuring a purse-net bin, arrived in 2001, after being designed by Rolls-Royce Marine AS and built at Karmøy by Karmsund Maritime Services AS. Powered by a Bergen Diesel BVM-12 main engine, Taits was lengthened to 71m at the Nauta Shipyard, Poland in 2009. This vessel was renamed Taits II two years ago, before being sold to Norway and renamed Steinsund.